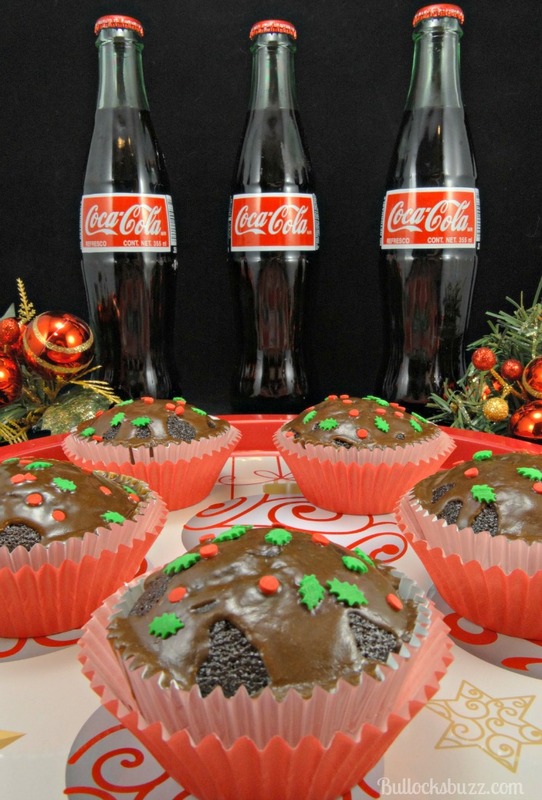 Check out these other DIY Christmas Crafts and Recipes you may enjoy. Using my Halloween candy-filled ornaments and DIY Thanksgiving Turkey Treats as inspiration, these fun ornaments are extremely easy-to-make, and take very little time. Although I used my Cricut Explore Air™, if you don’t have a die cutting machine, paint markers or craft paint will work just as well! 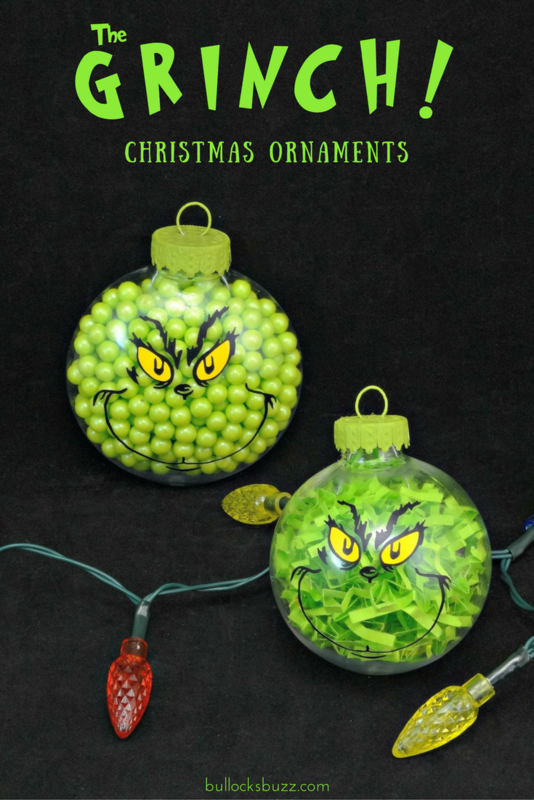 If you are using a die cutting machine, you will need a Grinch SVG file like any of these from Etsy for both ornaments. The candy-filled Grinch ornament is perfect for your tree, as holiday decor or even as a unique holiday treat! And the shredded paper-filled Grinch ornament will look great on the tree, and it makes a wonderfully unique gift! 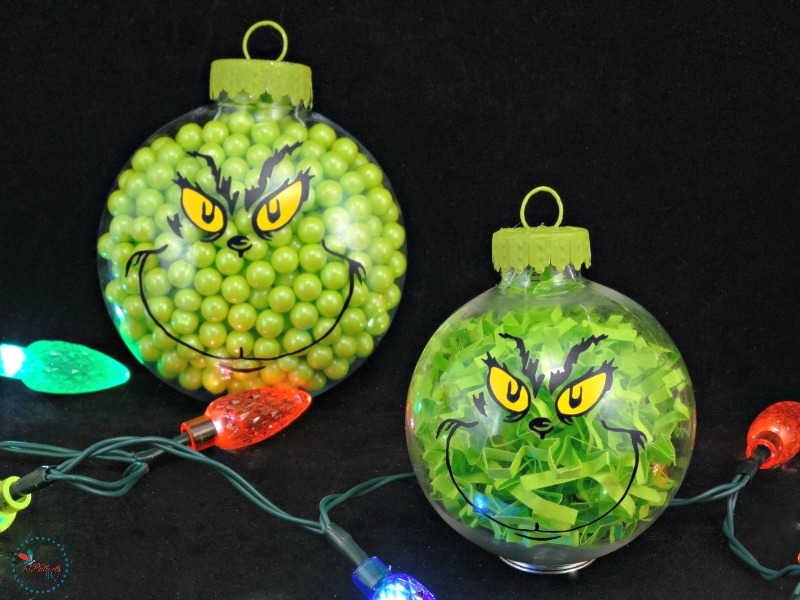 Best of all, these Grinch ornaments are extremely easy and inexpensive to make! Even the kids can help you and have a special Christmas memory to keep! (If you are an Amazon Prime member or like shopping through Amazon, you can purchase any of the necessary items by clicking them in the above list. These are affiliate links so if you make a purchase using them, I’ll make a small commission at no extra cost to you). 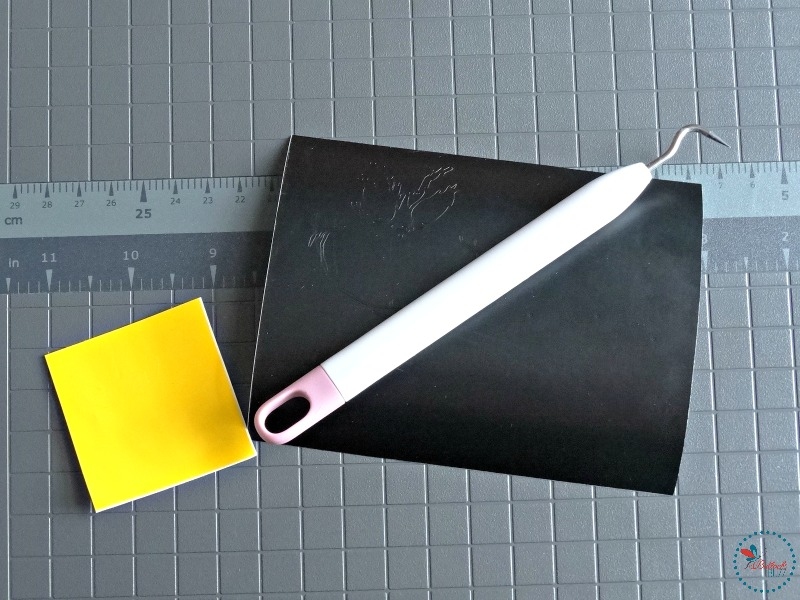 You can also find these supplies at any craft store, and even some supplies at dollar stores. Before getting started, wash the outside of both ornaments to remove any fingerprints, oil or other dirt. If you are going to give the candy-filled ornaments as gifts to eat, make sure you wash the inside as well. Let ornaments dry completely. 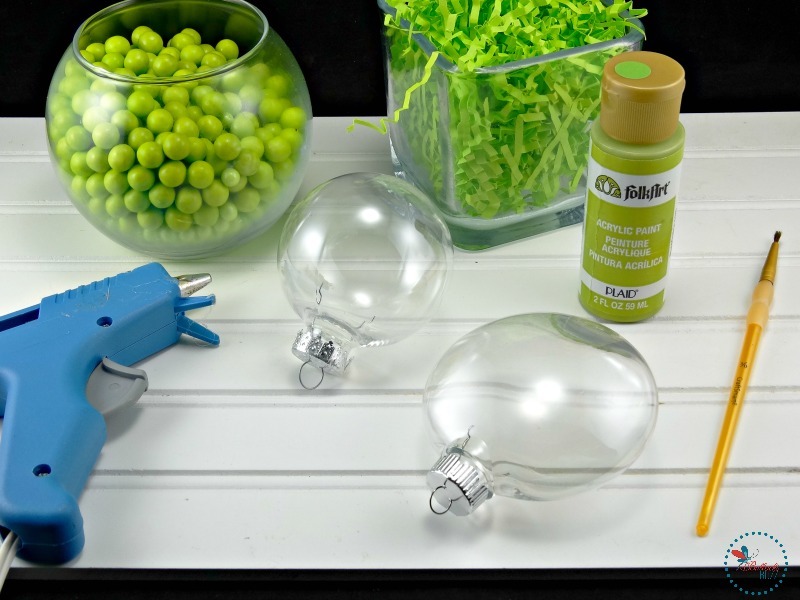 To get started, remove the silver caps from both ornaments and paint them green. Put them off to the side to dry. Depending on the paint, it may take two layers. 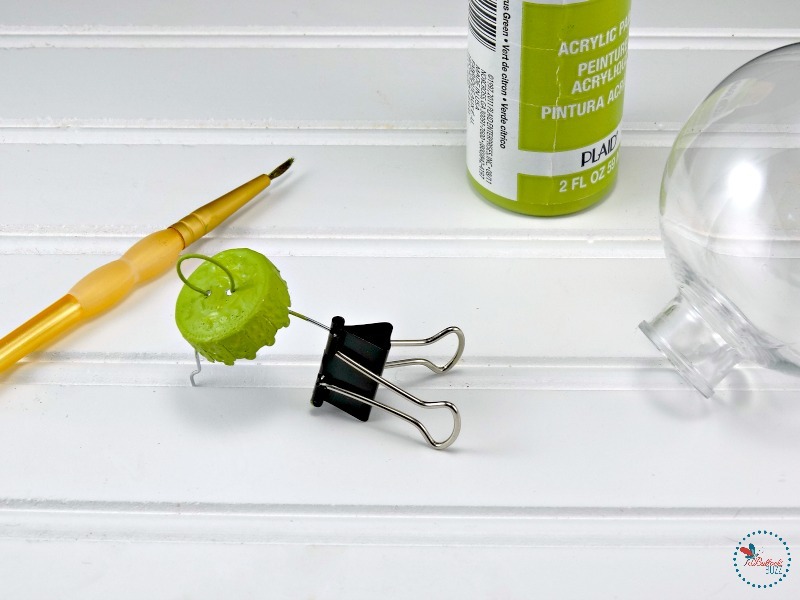 Tip: use a paperclip to hold the lids while you paint them and while they dry. 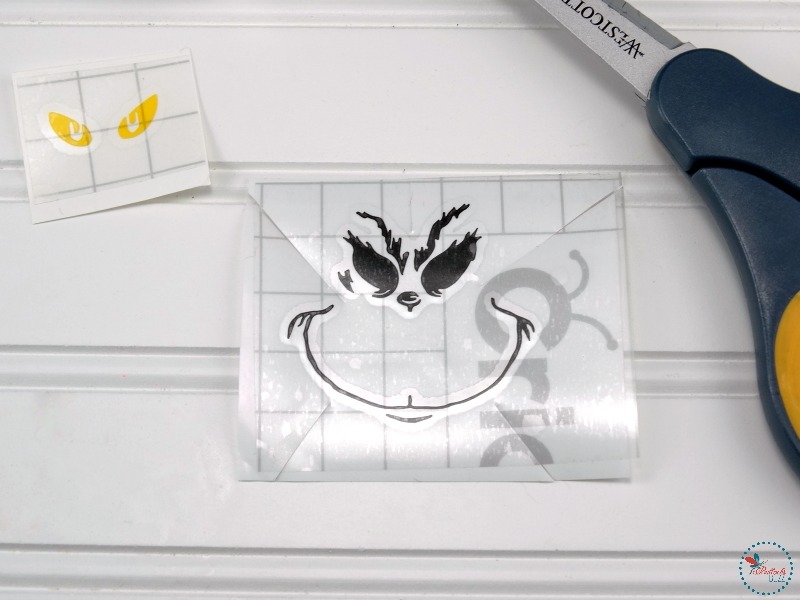 Next, if you are using a Cricut or other die cutting machine, open your Grinch svg file in Design Space or whatever program your machine uses. Size the file to make sure it fits the ornaments. 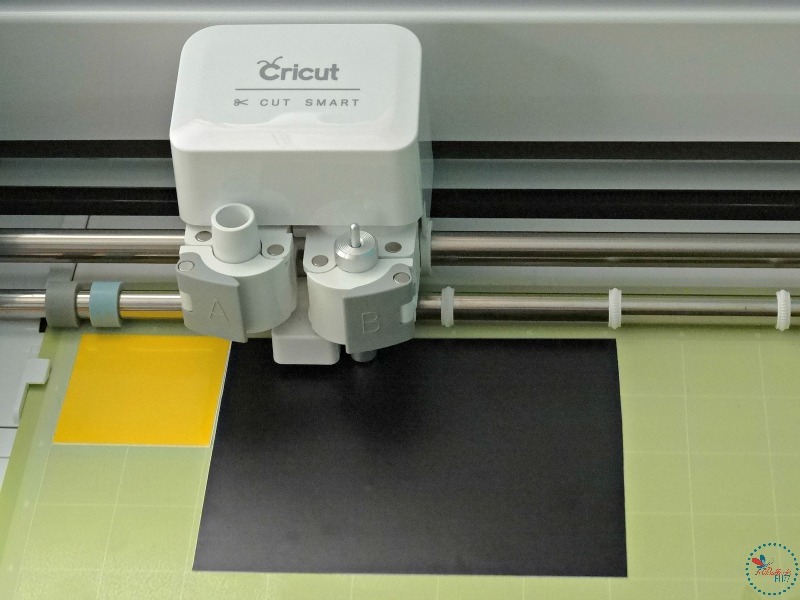 Place the vinyl on the mat, set your machine to cut ‘vinyl’, and then step back and let your machine do its thing. Once the designs are cut, peel off the top layer of vinyl. Next, carefully apply the transfer paper, burnishing it to make sure it sticks to the vinyl. Tip: for making ornaments, I usually cut some lines into the design to make it easier to apply to the rounded surface. Carefully apply the black vinyl to the ornament first, smoothing it with your spatula or a credit card once the vinyl is in place. Next, add the yellow vinyl eyes on top of the black, once again smoothing to ensure it adheres. Repeat with the second ornament. 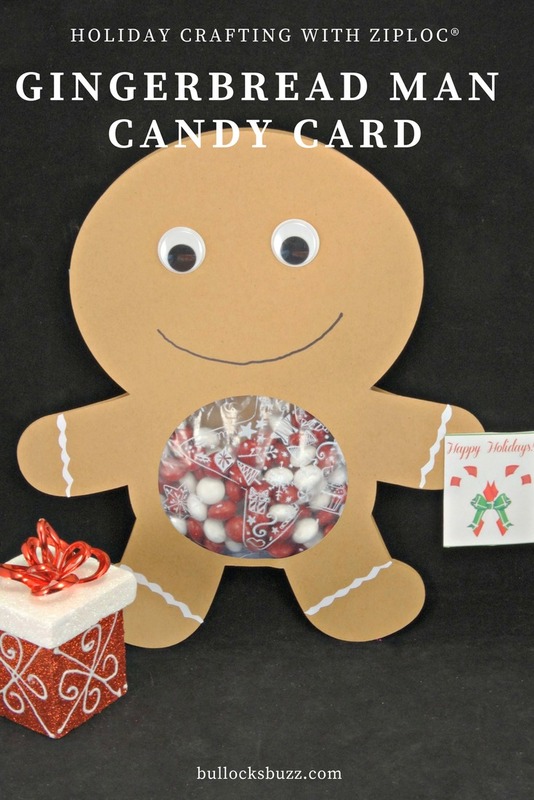 …fill the disc ornament with green candy, and replace the lid (if you are not using it as a treat, seal this lid with hot glue, too). You could also glue a green feather sticking up from the top if you wanted! So there you have it. 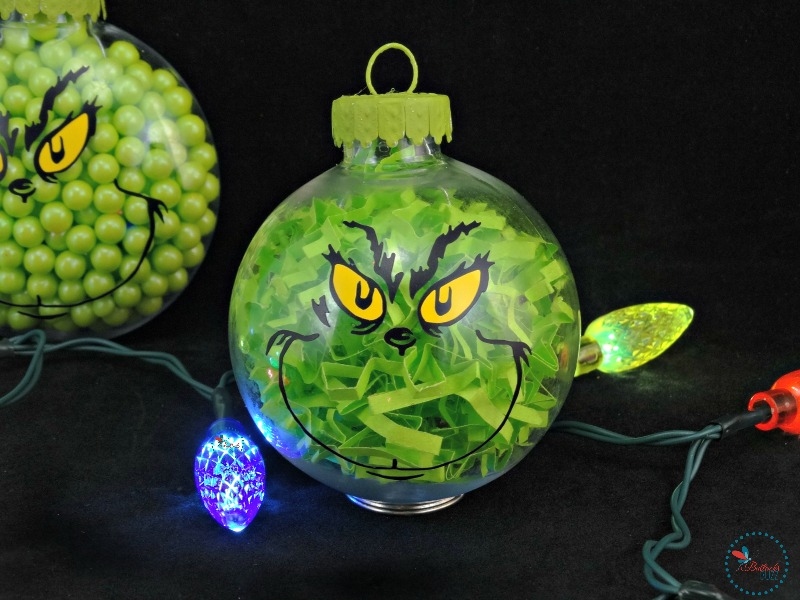 Two adorable DIY Grinch Christmas Ornaments that everyone is sure to love! Give them as a gift, put on them on the tree, or use them as decor around your home – and every time you see it you’ll be reminded of the true meaning of Christmas! 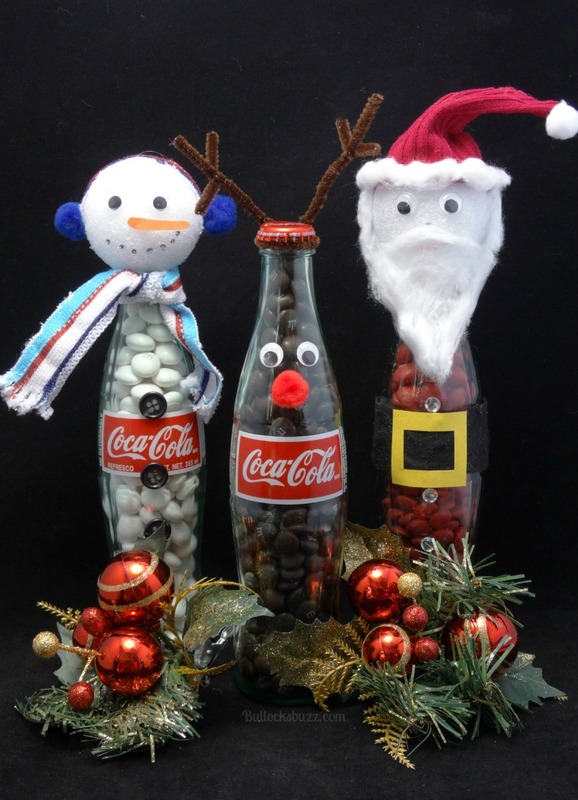 Do you have a favorite Christmas craft? I’d love to hear about it! 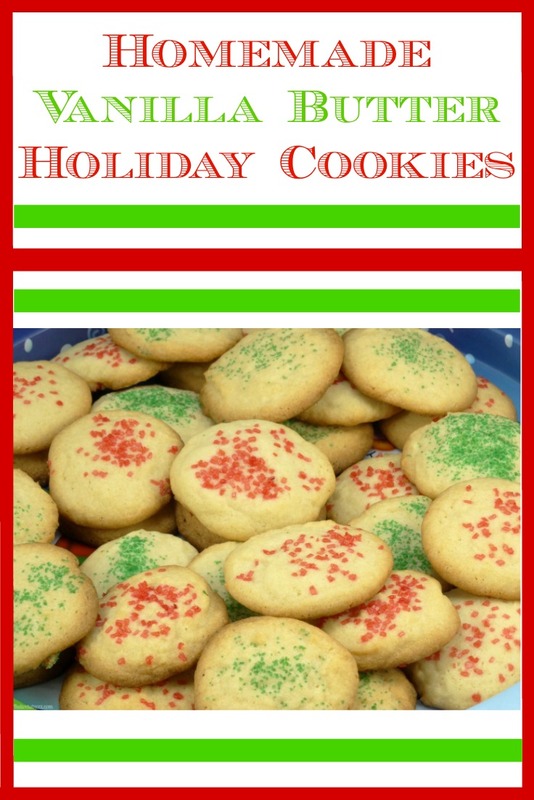 In fact, I may even feature your treat in a blog post, with credit to you, of course! Share with us in the comments below. These are amazing ornaments. It really surprise me because they are easy to make. Thanks to this step by step tutorial, it helps a lot. Nice Blog! You have explained very well all the steps above. Really helpful for art-lovers. I am going to stumbleupon very soon so that other users can also take advantage of it. I’d like to make these as the holiday craft for a class of 25 students. How much crinkle paper should I purchase? Thank You! Absolutely love these and they are so cute! I am SO happy you like them, and I’d love to see them once they are finished! My email is on the contact page of the site if you want to send a pic (totally up to you!). I going to guesstimate that two 4 ounce bags should be plenty, with some left over. It really takes less than a small fist-full per ornament using the round ones. Happy holidays! You may have already replied to this but my other computer died so here we go again! 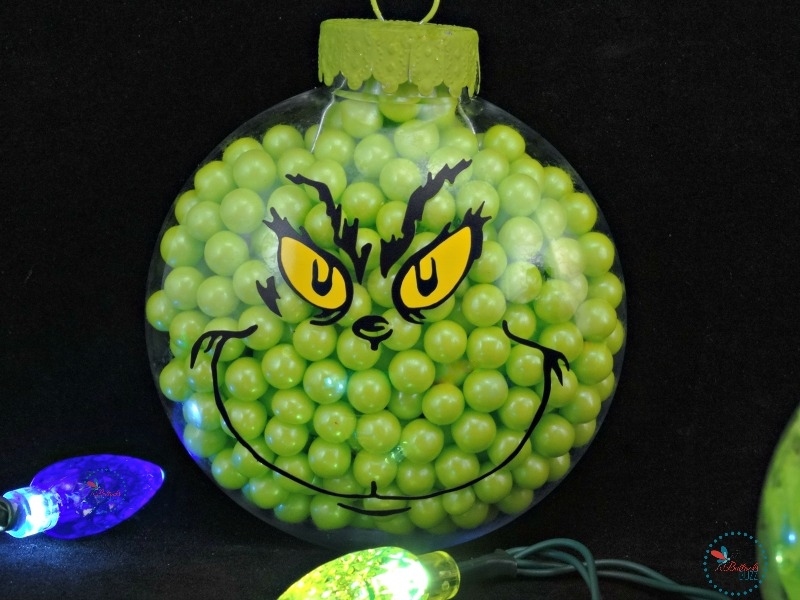 I have had trouble with two different purchases on Etsy of the grinch svg -_ please could you recommend one that actually works!! Hi Wendy! Sorry for the late reply! I’ve been working a second job to help out family. I went in and checked the Grinch SVG link and it goes to her page although no longer directly to the actual svg (I am about to change it to the exact link, not sure why she changed it). Did you try that actual one? If so, did you let the Etsy shop owner know you are having trouble? They will refund you if they can’t help you figure it out. What type of trouble are you having? I can try to help if I can. Let me know! Also, if you’d rather talk via email. mine is alainabethb (at) gmail. I am having a problem with the grinch. The direction says the disc ornament size 2.5 x2.38 to cut on vinyl. That works fine but the eyes are huge. What size are the eyes? When I sized mine, all of the facial features were ‘attached’ so I was able to adjust the size all together (the sizes are mentioned in the post). The black layer is all attached together, so I cannot get the measurement for the eyes alone. The yellow part of the eyes I just laid it on top of the other and made sure they matched up. However, separating them in Design Space, the yellow part measures 1.366″ by 0.55″. I’m so bad at trying to explain this – sorry! I hope this helps! Let me know.